Last edited by ISKA on Sat Sep 22, 2018 12:13 am, edited 2 times in total. Hello, I want to translate this game too. I'm Turkish translator. I unpacked english.bin with LoFPKGUnpacker too. Just like you, I don't have edit tools. Please someone help. Second: Whats the point in edit localization files if there's no PKG repacker?!? First off all, you need find were are located the resources that you want to mod. For texts, use some "Find in files" text search and point to game root folder, search for some game text, but something simple like "NEW GAME". HEX Editor have this feature, even Notepad++ have this. For textures, you can use that same text search, searching for the resource Magic(e.g. DDS, search for "DDS " text), or try some file ripper focused on game resources, like the HyperRipper from Dragon UnPACKer or similar. If that resources are packed inside some main package/big file, you'll need a tool/script to unpack those resources from your main package. For recents games, Zenhax is your best choice, but use the forum search before open a new topic asking for help. For older games, maybe you'll have more lucky on Xentax. There's a good chance that package allready cover by some quickbms script, so use the quickbms search: http://aluigi.altervista.org/quickbms.htm#search. And of course, Google it! Note about quickbms reimport: There's NO guarantees that all script works for reimport, its depends of the file structure and how the script was coded. And reimport doesn't support checksums(not sure). OK, you was able to extract those resource from main package, the next step is make sure that tool/script have import/repack/pack/compile feature, once you probably need do this for your mod/translation be readed by game. Once you extracted the resources try reimnport the untouched original resources back and check if the game works. If works, next step is mod just ONE resource, reimport and check ingame again.Be ware that reimport solution could not support moded files bigger than original, so try mod a file keeping your original size or smaller. With texts, use the original charset. If reimport doesn't works, STOP RIGHT THERE!!! There's a good chance that never will be a solution for this(reimport is too much more complex), and you will not waste your time(and the time of those trying helping you) with something that will be useless. You can ask for help with this kind of incomplete solution, but do this on the same place you found the unpacker/extraction solution. So ISKA, don't get me wrong, I'm trying to help you, it's the 3th time that I see you asking for help for a game that still not have repack solution. 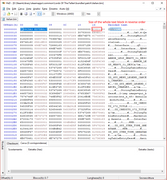 If you read the entire discution about this pkg files, you'll see that both aluigi and Ekey (two experts) worked on this format and still have no repack solution. I appreciate your determination, but sometimes we need move on. So even if I remove the MEMORY_FILE you will still have problems with lz4 and you will get files without extension. What About putarray 0 x CHUNK_OFF? That instruction simply puts a field read from the file in an array (an ordered location of the memory) for using it later. Maybe my msg was ignored some time ago, but… you don't need to "repack it". If you put the english.bin under "...\Lords Of The Fallen\bundles\patch" it works. Last edited by Hexaae on Mon Sep 24, 2018 7:53 am, edited 1 time in total. From a comparision between the French.bin and Italian.bin (see msg here with attachments) the first block is the same: FC89C5A3, next 4 bytes change between languages… If we understand that we should be able to edit the text and use it in the game simply putting the modified .bin under "...\Lords Of The Fallen\bundles\patch", skipping the unnecessary repack process. encryption crc 0x01800063 "32 0 0 19 1 1"
Last edited by Hexaae on Wed Oct 17, 2018 10:29 pm, edited 1 time in total. I'll take a look when got free time. Thanks Merlinsvk and Delutto For your help. Everything works great. It's worked me. Thank you Delutto. You are the best. Just a note: I don't mentioned but my tool update the CRC, so there's no need to use the CRC fixer script, the generated file is ready to use on game. Hello, Delutto. How can i repack unpacked .rpg files? I tried QuickBms scripts but not working.